The Explorer Plus (aka TI-32) is very similar to the Galaxy 40x but uses the housing of the Math Explorer. 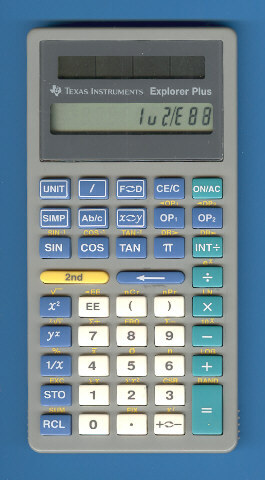 Within Europe an identical calculator was sold as TI-40 Solar. There is no relationship to the previous TI-32. Dismantling this calculator manufactured by Nam Tai Electronics, Inc. in May 1997 reveals a typical "far-east" design with a single-chip calculator circuit in COB-technology. Please notice that this TI-32 Explorer Plus uses smaller solar cells than an earlier model manufactured in Italy. Compare the two calculators here. Later the same keyboard layout was used with a more stylish housing. Compare it here. allows operation even in low light. • Durability: Plastic keys are tougher and more tamper-proof than rubber keys. An extra window protects the LCD display and the solar cells. • Keyboard: Color coding helps children quickly identify functional key groupings. Large, well spaced keys are easier to find and press. • Functions: Choose a model with only the specific functions you need. In the year 1995 Texas Instruments provided a total of 6 different calculators (not counting the Graphing Calculators TI-80, TI-81, TI-82 and TI-85) to meet the above demands. View a comparison table here.